One of the criticism of the design is, essentially, a big, windowless box that blocks the river from the street (a wide outdoor stair would connect to the street level and riverfront). So we thought the video clip embedded above was interesting -- it's by an architectural designer from Niskayuna named Tai Xi posted the design and video earlier this year as a way offering feedback. (It was highlighted by the We Care About the Square Twitter account this week.) In the design, the movie theater space would be raised up one level to create a covered plaza that extends from the the street out toward the river. Among the tri-city, Troy is the most beautiful one, thanks to the better preserved urban layout, authentic architecture and interesting topography. She deserves better buildings of both quality design and construction. So far, to fill the void at 1 Monument Square, several winning proposals seem fall short on grasping the essence of the site. When there is no vision with clarity based on the consensus of various stake holders, all becomes a guesswork in the dark. No wonder it's so hard to pin down a good scheme. As a trained architectural designer (also a licensed Architect in Ontario, Canada), I can't help to do some critiques in my counter proposals. In the latest Bowtie cinemas episode, I can see the most damning mistake is putting a blank big box right on the ground level of River St creates a long and tall wall facing the square. How to salvage the proposal as it is? Quite simple, elevating the cinema box to the second floor so that the street level can be freed up for more animated uses. This is a proven solution; one can find many real life examples in big cities. This setup does cost a bit more, however, to build a landmark in a historical city has never meant to be cheap. The prestige shall worth some extra investment even in the all-for-profit business world. Tai Xi said he reached out to the city about the design idea, but never heard back. 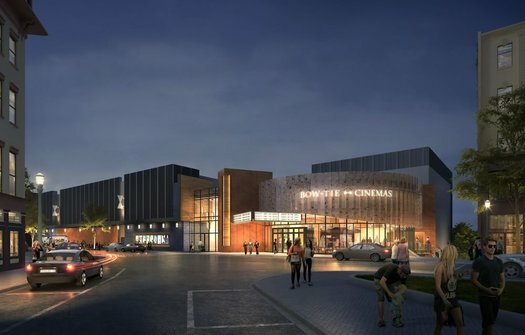 One of the renderings of the project proposed by Bonacio Construction and Bow Tie Cinemas. In our email exchange, Xi added this point at the end: "To generate more meaningful dialogue, we need a more effective platform driven by Google Earth 3D model and graphic comments. Casual writeup without concrete graphic reference can hardly move things forward to reach a satisfactory conclusion." We thought that was interesting because it gets at one of the frequent frictions when these sorts of projects get introduced to, and discussed by, the public: It's a lot to easier to say "I don't like this" than it is to show what people would like instead. And that's totally understandable. There aren't a lot of people who have the skill and time to crank out their rendering of a building. And, frankly, trying to crowdsource the design of a building -- no matter how big or small -- sounds like a recipe for a bad outcome. But there's also gotta be a better way for municipalities to gather feedback. Sure, people can go to the planning board/commission meetings and say something during the public comment periods. That's admirable and useful. Again, though, that format probably leans more toward "no, not that" and away from "more like this." People -- even critics! -- often want to offer constructive feedback. They just don't have good tools to do so. We don't know if there's an answer for resolving this friction. It just seems like we all should be able to do better given the proliferation of digital media. We got in touch with John Salka, the spokesman for the city of Troy, about Xi's design and offering feedback. Salka pointed to people participating in the planning commission process, and he said the commission is accepting written comments via email -- they should be sent to Chris Brown in the planning department at chris.brown@troyny.gov. Site of the extant cast iron facade Warren Building, this cinema will be a generator for activity downtown. Nineteenth century Troy like many industrial cities, turned its back to the waterfront and its potential now gets a second chance. Site lines of the water feature are important as are the functional aspects of a design but how apparent was that criteria at the programming phases to have avoided these often late in the day critiques? This design relies on the architectural technique of circuitous seduction through level changes to reach the Hudson ... Lighting will be important and I'm certain its been factored in. Is it really that difficult???? Seriously! This cluster---k makes me yearn for the old brutalist city hall to be rebuilt! "Lighting will be important and I'm certain its been factored in." Exactly my thought; who enjoys walking through a parking garage at night? Seems that's what this would feel like. It's certainly a creative solution, though I'm not familiar with the examples in other cities that Xi mentions, any pointers in that direction would be welcomed. I still don't know why it has to look like a spaceship. There are countless downtown theaters that fit in aesthetically with their surroundings. I was just in Arlington, Massachusetts and they have a six screen theater in a building fronted with a bakery, a toy store, a salon... Thinking that theaters can only look like suburban malls shows either a lack of imagination or a lack of awareness. Maybe Chris Brown could arrange to have an interactive video set up at the Planning Commission meeting. This would enable people to make suggestions and see how they would look in real time. Use the technology that is available and stop the bickering for the love of Troy! American movie ticket sales in terms of tickets sold have been flat or declining over the last couple of decades. Revenues are up slightly, but only because they keep raising ticket prices. The location does not have good parking options and the design does not fit with the rest of the area. Some investors may make some money in the short run, but in the long run it will end up being a white elephant just like the city hall building was. Haste makes waste! Waite for a better solution. Please! Movie theaters have experiences a sharp decline in attendance over the last few years, a trend that is gaining momentum as more and more online streaming services are developing and producing top notch entertainment. Building a megaplex cinema in downtown Troy is not only a bad idea, itâ€™s extremely shortsighted and a terrible business decision.